Nice variety of pieces for you to use! Fine craftmanship is highlighted by attractive styling in this 17-Piece Surgical Stainless Steel Cookware Set that offers a variety of pieces for your kitchen arsenal. 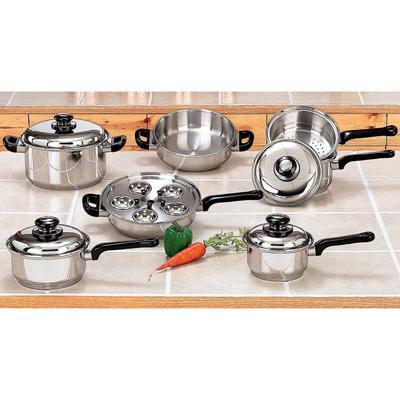 This assortment of stainless steel pots and pans has a size required for your recipe needs. Make soups, sauces, stews, main dishes, roasted meat, vegetables and desserts, even poached eggs, in the special stainless pieces included in this nice cookware set. Stainless steel material Is durable and offers excellent cooking performance. Impact bonded bottom Is extra thick and assures fast and even temperatures with no hot spots. Precision formed rim and cover Produces a waterless seal. Special cooking technique Allows adjustable cooking times by using stored heat to achieve greater retention of nutrients for healthier eating. Phenolic handles Are heat resistant and fastened securely with stainless steel capped rivets. Satin polished interiors Are easy clean. Pan bottoms Are marked with pan sizes to aid cook in choosing best size for meal preparation.